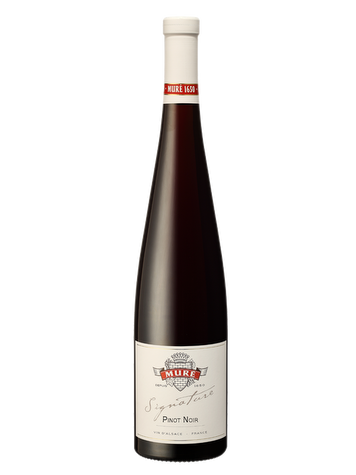 Its pale ruby color offers a nose of cherries and smoky notes. On the palate, this wine is light, nervous and has character with a finish on silky and satiny tannins. Originally from Bourgogne, Pinot Noir is the only red grape variety authorized in Alsace. Located in Westhalten since 1650, the Muré family cultivates the vines. It is represented today by the 11th and 12th generation. In 1935, Alfred Muré, René's grandfather, bought the Clos St Landelin, a 12-hectare vineyard, which established the domaine’s reputation and has remained the family’s monopole. The domaine’s other vineyards lie on the neighbouring terroirs of Vorbourg, Zinnkoepflé and la Côte de Rouffach. Viticulture: Harvesting is done manually. The vineyard practises organic growing. Vinification: Pinot noir is macerated, including some in whole clusters, without destemming. During maceration, pigeage and remontage are done case by case. The wine is then matured in barrels. At the end of maturation, the wines are lightly filtered, so that they retain maximum quality.